Is the Chevrolet El Camino making a comeback? If Twitter has the power to influence GM’s Chief Marketing officer to make this happen, then perhaps fans of the coupe utility vehicle that debuted in 1959 will see it at their Chevy dealer in the near future. Anyone who knows the power of Twitter can guess what happened next. The tweet made its way to El Camino fans around the globe and in record time, there were thousands of tweets about the the car that has long been rumored to be making a comeback. In fact, there were so many tweets that the website, Jalopnik.com jumped on the bandwagon and tweeted to their 21,000 plus fans that “GM will bring back the El Camino if 100,000 people comment” on their post. Hours later, the site drew over 1,000 comments about the El Camino. Despite the tweets creating a buzz, is the El Camino truly a priority for GM? While Joel Ewanick certainly dangled the carrot out there, it seems more like a good public relations play than anything else. The Chevrolet El Camino made its debut in 1959 and was a hopeful rival for the Ford Ranchero that arrived on the scene in two years prior. While it didn’t outsell other Ford products in ‘59, Chevy sold 22,246 El Caminos in its first year, beating Ford's 14,169 in Ranchero sales. The El Camino went through changes over the years, with the fifth generation of this car-truck ending production in 1987. For now, enthusiast can find the Chevrolet El Camino appearing at custom car shows as a “muscle car” or even customized as a hot rod in a variety of racing venues. There are also many still used as daily drivers and they aren’t hard to spot with their unique styling. Twitter has certainly driven up interest about a possible come back of Chevy’s classic El Camino. But it’s not likely that the company will put this on their hot list if creating cars with good fuel economy is a bigger priority, especially with the gas prices rising at the pump. Still, it’s interesting to see how big the fan base is for the El Camino. Perhaps Chevrolet will take this into consideration and make it a hybrid vehicle that pleases enthusiasts and those looking for better gas mileage. Here is one in favor of GM bringing back El Camino. I would like to see traditional cars on our streets. How is next in support of El Camino's return? The ElCamino is still produced in Australia as the Holden UTE (HOLDEN is a close associate of GM). The SS Version uses the same corvette motor and 6 sp manual transmission. I test drove one while I was there. The underpinnings are/were the same as the Pontiac G6. BRING IT TO THE US!!!! I might even be tempted to sell my '86. Nice info shared. The car El Camino in the pic looks amazing. awesome. I need a new El Camino to park next to my 1965 El Camino parked in my garage! I'm putting my vote everywhere I can, so here's one more! On the point of GM needing to develop other cars, the potential El Camino is already developed in Australia (Holden Commodore), AND the engines are EPA tested already (same v6 and v8 as the Camaro). The Pontiac G8 ST would've been the new El Camino if not for the brand's demise. Even if its not a top priority, its not so farfetched. P.S. I'm the same Mike Knower you're referencing in your article. 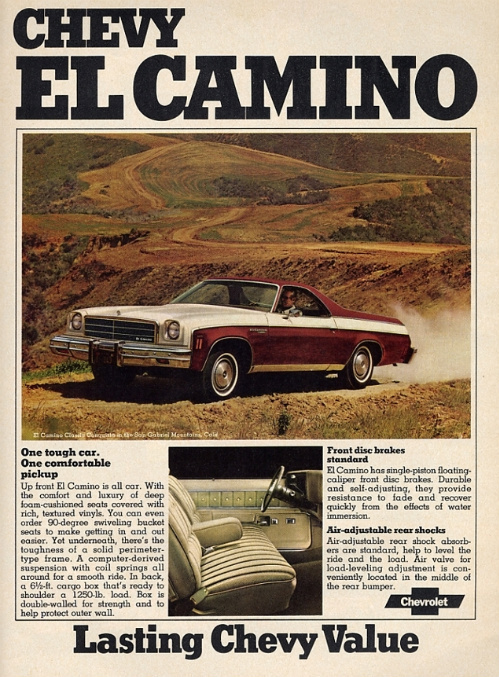 perhaps you could email around a petition to bring the el camino back and present it to GM. GM crushed my dream of owning a Pontiac G8 ST. I really wanted that vehicle. GM will probably not rebadge a Holden and bring it to the US because GM wants to sell 100,000 units. The problem is GM no longer wants to sell us what we want. They have women in focus groups deciding what we want. I want an LS engined El Camino style wagon Dammit! I would personally beat the dealer's door down to get to one of these. Have been looking for an El Camino for years. It is the only car that I ever wanted that I have never managed to own!! I wasn't aware of this Holden until now. Going to look into this!! PLEASE, PLEASE, PLEASE powers that be make something like this available in the States!! Here's a little hint GM: STOP building the money losing Volt and bring back the El Camino. If Chevy comes out with an El-Comino I will sell what ever vehicle I then own at that time and buy one, of course with slight observances. I mean I'm not jumping off a cliff without safety equipment but usually Chevy builds great El-Cominos from past experiences. Bring it on! !